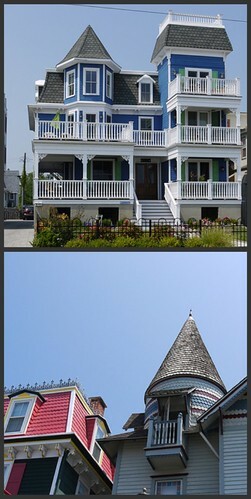 cape may houses, originally uploaded by ordinarymoment. At the very bottom tip of New Jersey is Cape May, a charming little town filled with old fashioned houses. Rather fancy for my taste, but fun to admire the craftsmanship that went into all the details. Bright houses, gigantic old trees, lush landscaping with flowers everywhere. Salty air, quite the place to be.